In this article I am going to demonstrate how to customize your MSI install to prompt the user for some information and then pass this information to an installer class. This can be useful when needing to do something during an install based on the user input. 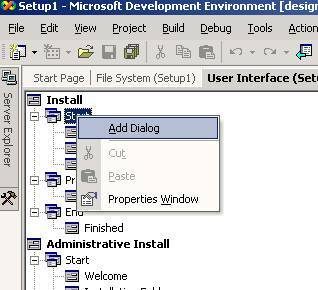 There are two key parts to this process the first is the addition of a custom user interface dialog and the second is passing whatever information is entered into the new user interface to the installer class in order to do something with this information during installation. 1. First start a new Set-up project. 2. Next we need to make the modifications to the default user interface settings. Navigate to the view/Editor/User Interface as shown below. This brings up the User Interface editor and displays the default MSI user interface. You can see that this is broken up into a couple of different sections that are common to all MSI setups. An important thing to notice is the ButtonProperty that is currently set at BUTTON3. This is the name of our newly added user interface item and ultimately the variable that holds the value that the user has entered when the MSI is run. 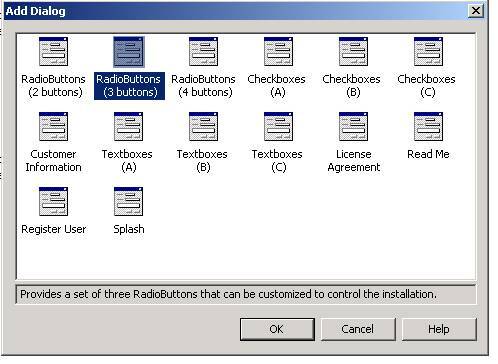 In our case the screen we added contains three radio buttons and based on what the user chooses at the time of the install the BUTTON3 variable will hold a 1,2 or 3. Part Two: Passing Information to the Installer Class. 5. 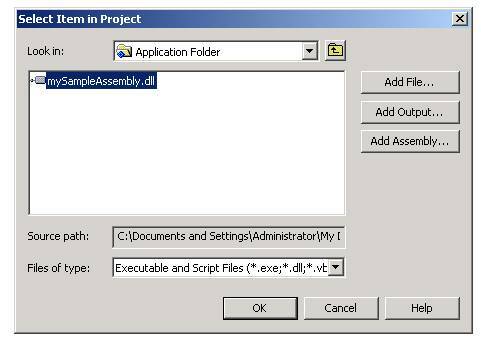 Next we need to create a sample assembly and include an installer class in the project that will accept the information input by the user and do something with it. The addition of the installer class is the same as an earlier article I wrote with one key difference. 6. Create a simple assembly and call it mySampleAssembly. 7. 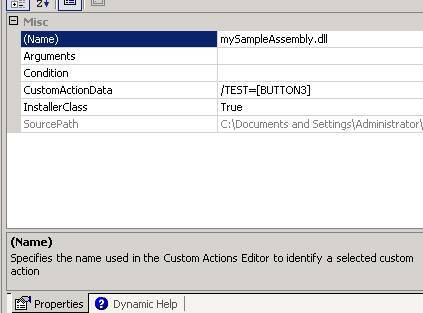 Next right click on project name in the solution explorer and choose add new item and double click on the installer class icon. This does nothing but get a value from the parameter named "TEST" and put it into the eventlog. 9. We now need to add this newly compiled assembly to our MSI project that we were working on earlier. Go back to the MSI project we were working on earlier and click on the View/Editor/File System, which will bring up the file system editor in the msi project. 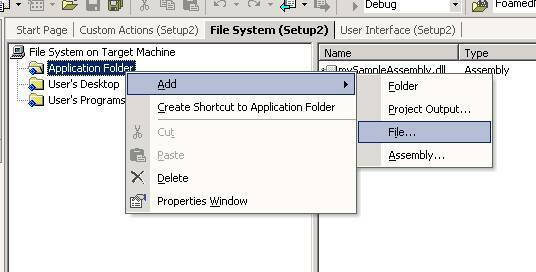 Right click on the application folder and choose add/File as shown below. Navigate to the MySampleApp assembly we just made and add it to the msi project. 10. Next choose the View / Editor / Custom Actions menu item, this will bring up the custom action dialog menu as shown below. 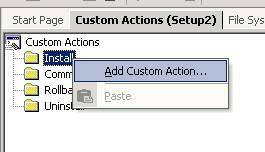 Highlight the install folder and right click on the folder and choose Add Custom Action as shown below. Navigate to the assembly we just added to the installer class and click ok as shown here. This tells the MSI project to run any installer classes that is in the MySampleAssembly assembly. Finally, choose the properties of the custom action and modify the properties as shown below. Notice in the CustomActionData that we are placing a /TEST=[BUTTON3]. 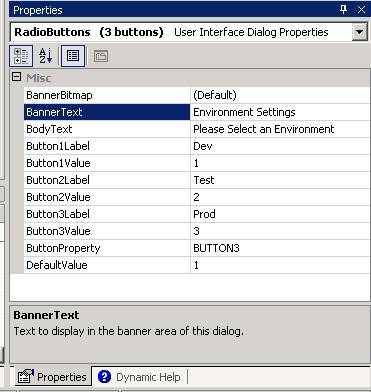 This tells the installer class to pass the value of the Button3 user interface object to the installer class in a parameter named TEST. In this particular case it is a 1, 2, or 3 that will be passed to the installer class but it could be anything from a database name to a server name that is passed to the installer class. 11. Finally, compile and run the msi eventually you should see the new user interface and will place a 1, 2, or 3 into the event log based which radio button you chose. In this article I demonstrated how to add a custom dialog to an MSI and take the information received from this newly added dialog and pass it into an installer class. This can be useful when creating MSI's that need to behave differently based on some user input. Passing Information To Installer Class.